Please refer to our stock # 01646 when inquiring. 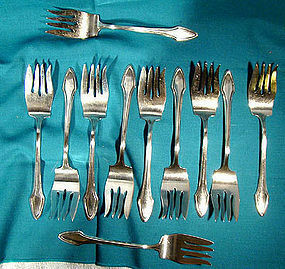 A set of eleven 5-7/8" silver plated salad forks in the Molly Stark pattern, introduced by Alvin (Gorham) in 1916. These forks have no monograms, and they are in excellent original condition with no dents, bends, corrosion, losses, damage or repairs. Please note that they may not have been polished in our pictures, but the forks will be hand polished before shipping. All items are thoroughly and conservatively graded and all condition issues are noted; all items are vintage or antique and may have slight signs of gentle use. Surface shipping to the continental U.S. starts at $7 (other spots may vary) - insurance included to $99. Items paid with a credit card will be shipped to confirmed addresses only. We do ship internationally. All of our prices are in $US. PLEASE NOTE: We DO NOT accept PayPal.